Much of life seems to be ruled by an imaginary pendulum, swinging back and forth between polarizing opposites. Of course there is a middle ground full of blurry grey lines throughout, but there always seems to be two endpoints at which stand opposite choices of equal force. 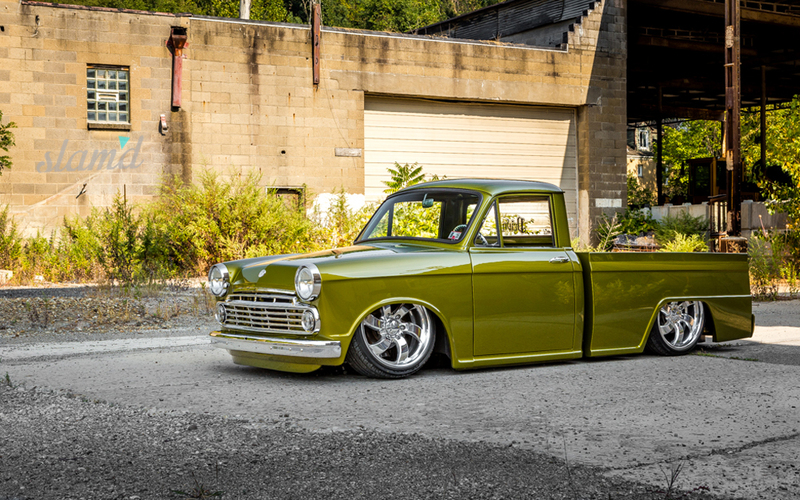 The world of custom cars and trucks is no exception to this general rule of order. Some choose to keep things subtle, understated, and within the calm but pleasant waters of factory condition. Others tend to dabble in the deep end a bit, venturing from time to time into less predictable zones of modification. Then, there are the ones that take on oceans unknown and plunge headlong into the uncharted territories of complete customization. Many of us have felt that tension, attempting to settle on one side of the pendulum. 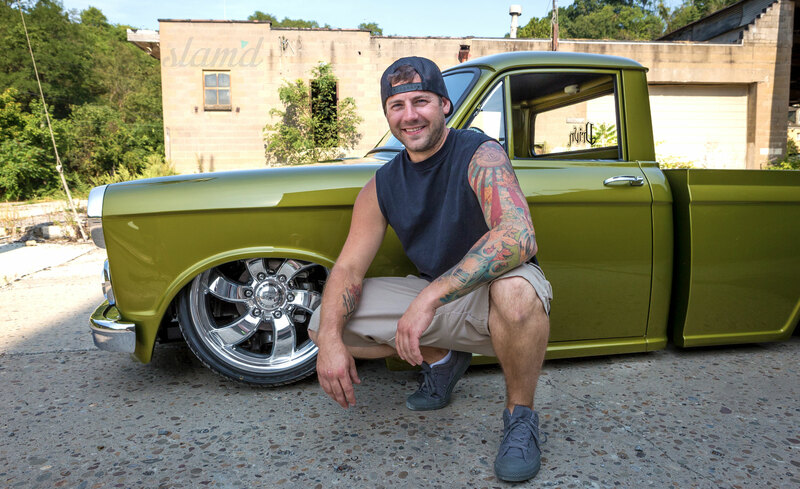 For proud #teamslamd supporter, Joe Contenta, he eventually knew that in regards to his Datsun, that it would be all or nothing. He picked up the well kept and overall clean 1965 Datsun L320, and wrestled with the demon on his shoulder for nearly a year before really getting his feet wet. All it took was a simple internal resolution to “cut up” his factory classic and before he knew it, he was committed to a full-scale custom project. 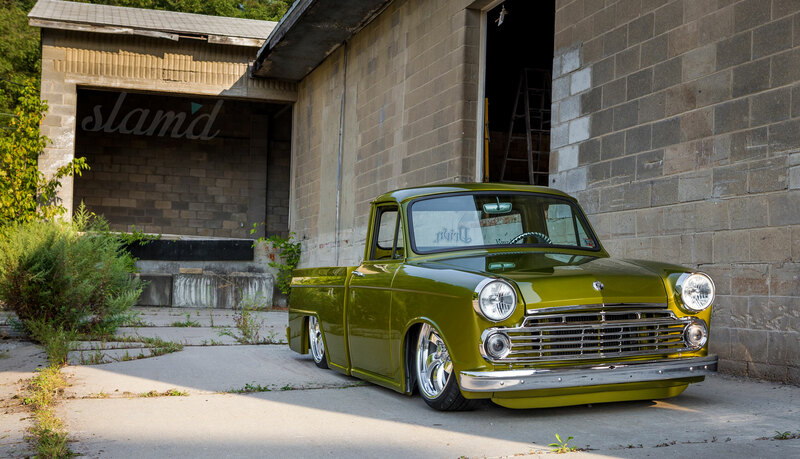 It was in 2002 that Joe was first exposed to the world of custom cars and trucks. 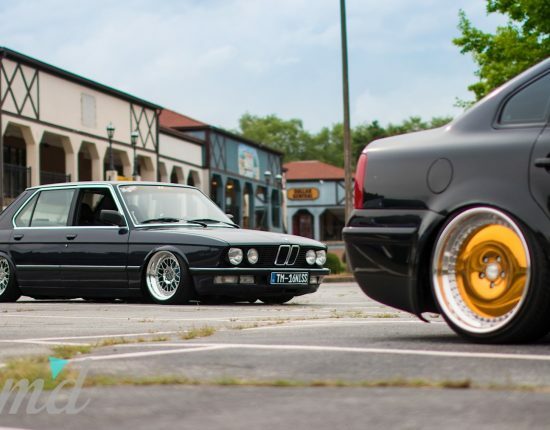 He happened to be vacationing in North Carolina the weekend of a Pebble Pusher Car Club show. 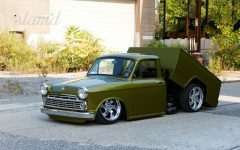 His interest in the scene has been peaked ever since, which led him to build a ’94 Sonoma awhile back before stumbling across what would soon become his glorious homebuilt Datsun 320. For his Datsun, he set out on the simple journey of building something unique with this already special platform. 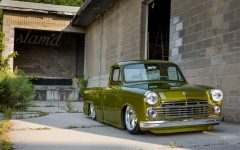 His motivation was to complete a project in the custom minitruckin’ style that he admired, that would (for the right reasons) stand out from the rest. 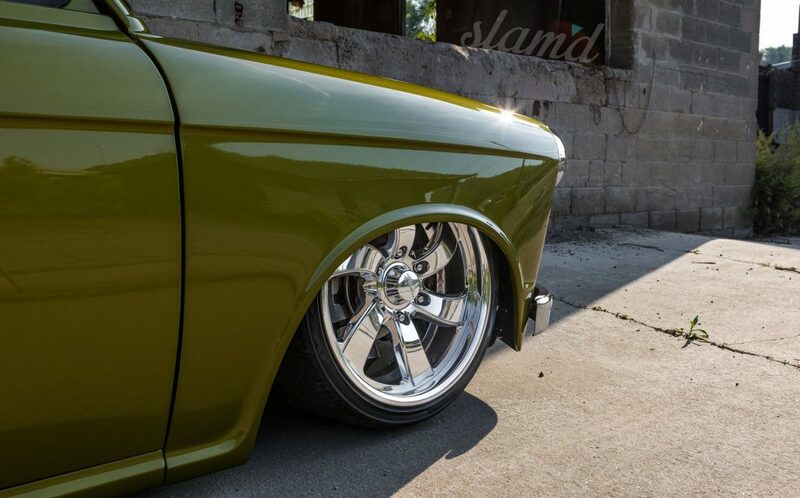 And wanting to learn and do as much of the build in his home garage as possible, nothing on it went untouched and nothing about the fully custom build is “bolt-on” in nature. Joe spent the better part of five years completing his project, in his two-car garage. With hand tools, hard work, and a whole lot of practice with a welder, Joe stayed the course and saw his vision through to completion. The hard parking suspension is all hand-built by Joe, form fitted to his Datsun with fantastic quality. Custom upper and lower control arms in the front work in conjunction with the Slam Specialties SS-5 airbags helping to plant the front low to the ground on demand. The rear is leveled out with another from-scratch built system, utilizing a triangulated 4-link with Slam RE-6 ‘bags. 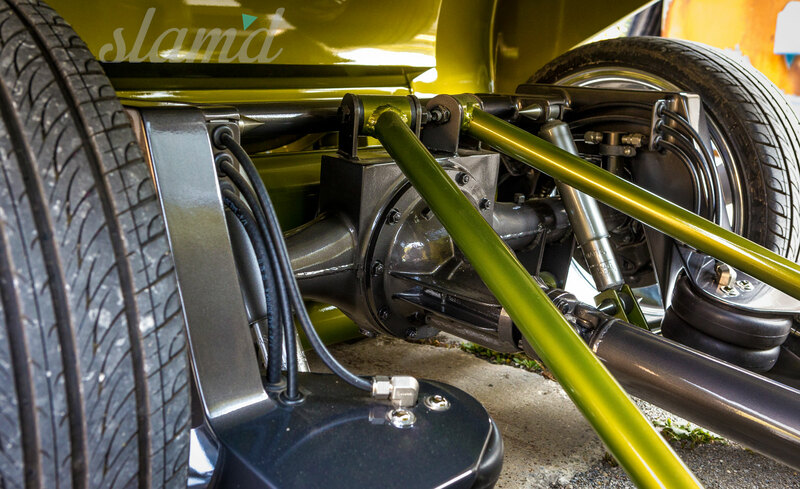 High-quality Monroe shocks further aid the rear set up providing comfort to the driving duties. Everything but the framerails themselves are custom made underpinnings. 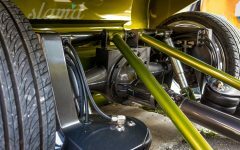 The suspension’s height is regulated with Air Zenith OB2 compressors and supplied by two tanks and stainless steel hard-lines throughout. The body modifications, in matching fashion and with matching quality of excellence, were also done by hand in Joe’s garage. The first portion of the body work includes very meticulously shaved details. 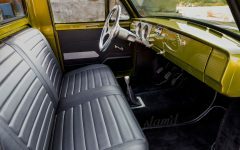 The key holes, side mirrors, tie down hooks and top bed rails, gas filler, and windshield wipers have all been filled and shaved to a seamless finish. 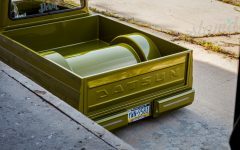 Continued work meant shortening the truck’s bed a significant nine inches and dropping the sides to create level lines with the rocker panels. After the repositioning and flow, the entire bed both inside and underneath was smoothed. Finally the truck bed was set up for air operated dump style action, cleverly utilizing the E-brake as the actuator. The Datsun’s flat and beautiful body styling is complimented with high-end chrome contrast. The mirror finish begins with 18-inch Raceline Deceptive 6 wheels, which are a perfectly matched size for the truck’s proportions. The Raceline’s wear 215/35/R18 Nangkang tires. Seated behind the highly polished spokes are stock rear brakes and the fronts are converted to Nissan hardbody disc brakes. The disc conversion includes a booster and master cylinder, all of which is tucked underneath the interior dash. Powering Joe’s green machine is a 4-Cylinder A14 series motor, plucked from a ’79 Datsun B210. The motor brings its transmission with it and puts out a cruising 68 horsepower, which is plenty for this tiny mini. 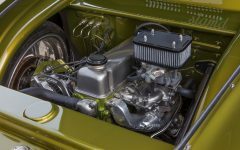 The exhaust and headers combo is an adapted stock version that has been ceramic coated to clean up the engine bay and rolling chassis even more. The whole interior was customized and finished for a simple, clean styling, with factory derived class – much like the rest of the highly custom, yet subtle exterior. The stock bench was reupholstered, along with the carpet, door panels, and headliner. The radio, and speakers were all removed, further extending the minimalistic cleanliness, and the factory gauges were restored and pinstriped. Top notch interior work was performed by Trick Labs of Butier, Pennsylvania and the hand laid stripes on the gauges were done by Atomic Bot. 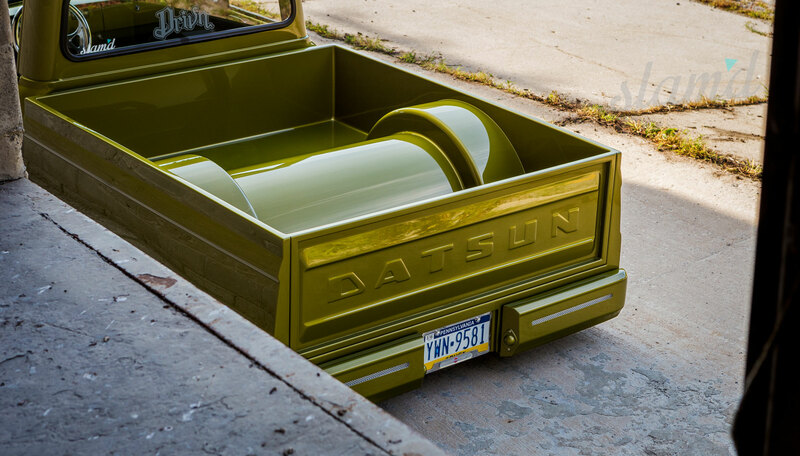 With such polished detail work characterizing the Datsun, a quality paint finish was an absolute must. Nevertheless, Joe’s commitment to individuality and stand-out styling led to the very unique and totally custom paint coloring. The mix is a bright kelly green, silver, and gun metal grey. 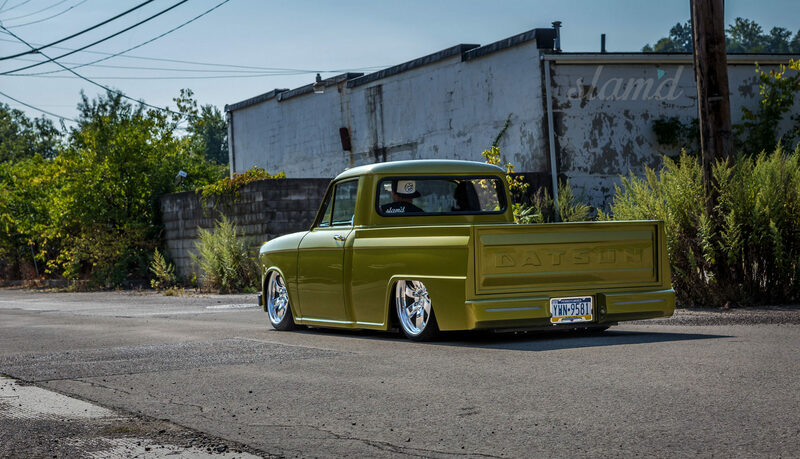 The final color just plain works for the truck and sets it apart in the way that Joe had always intended. The final painting and clear coat were done by Tom Dionisio.